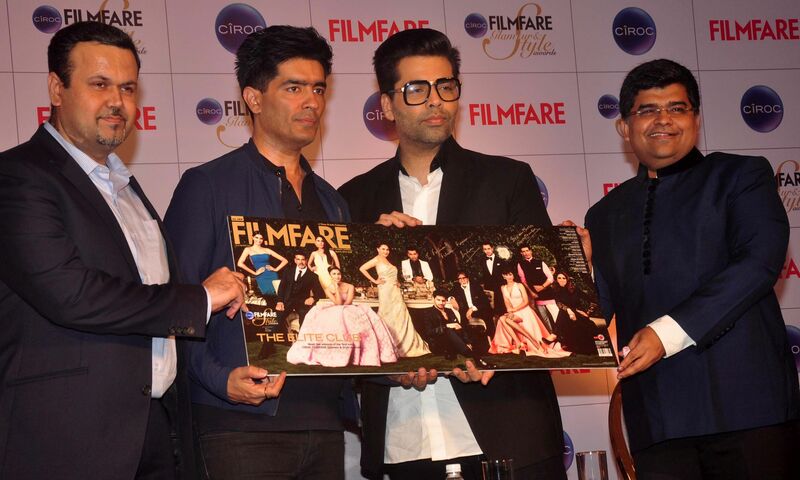 The Ciroc Filmfare Glamour & Style Awards special issue was launched by Karan Johar – winner of the Most Glamourous Director Award and Manish Malhotra – Winner of Most Glamourous Designer; along with Mr. Jitesh Pillai – Editor Filmfare and Mr. Bhavesh Somaya, Marketing and Innovation Director, Diageo India at J.W Marriott, Juhu. The inaugural Ciroc Filmfare Glamour & Style Awards was an occasion to celebrate the most stylish and trend setting stars of Bollywood. The event was an unprecedented success with the who’s who of glitterati turning out in big numbers. From Amitabh Bachchan and Sridevi to Sidharth Malhotra and Alia Bhatt, everyone walked in their sartorial best and everyone from Akshay Kumar to Karan Johar to Manish Malhotra took home the illustrious new trophy. The chic evening had dazzling performances by popular singer/composer Gingger Shankar and singer/song-writer Nikhil D’Souza. The stunning Kamal Sidhu, who was the emcee of the night, brought the house down with her witticisms. Special occasions call for special efforts. An opulent set was designed at the venue itself to lend elegance and exclusivity to the photos. Ace fashion photographer Arjun Mark brought his unique touch to the pictures of the winners. The result was a master stroke of creation, a three-page centerfold capturing the winners in all their glory. The Awards Issue celebrates the occasion on paper, with the show report giving you an insider’s account of all the crazy happenings, the issue also highlights who wore what and by whom on the red carpet. It’s the definitive almanac on movie world fashion. It also contains a detailed pictorial essay on our trophy winners. This entry was posted in Trending News and tagged Unveiling The Special Ciroc Filmfare Glamour & Style Awards Issue.